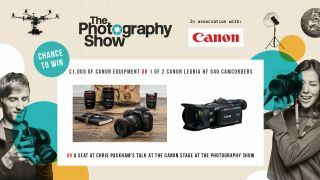 Win £1000 worth of Canon kit with The Photography Show! Two LEGRIA HF G40 camcorders and a seat at Chris Packham's talk at The Photography Show are also up for grabs! Fancy getting your hands on a nice new Canon DSLR? Or perhaps an L-series optic to complement an existing body? Or maybe you want to go mirrorless? The Photography Show is giving you the chance to win £1000 worth of kit of your choice from the Canon store, in addition to two LEGRIA HF G40 camcorders. As if that wasn't enough, 24 lucky winners will also get to see Chris Packham's talk at the The Photography Show 2018, the UK's biggest and best photography event that returns in March to Birmingham's NEC. Just head over to The Photography Show website and follow the instructions. Good luck! New lens? It could be all yours! 1. The Promoter of this competition is Future Publishing Ltd.
2. By entering this free prize draw, all participants are deemed to have agreed to be bound by these Terms and Conditions and Competition Rules: www.futureplc.com/terms-conditions/ unless notified otherwise in writing. 3. All entrants (“Participants”) must be UK residents aged 18 or over. 4. Aside from Canon (UK) Ltd (if opted in above), your data will not be passed on to any other 3rd parties without your permission. 5. No employees of Future Publishing Ltd or Canon (UK) Ltd, its subsidiary companies, their families, agents and other parties directly involved with this promotion and the sponsorship are eligible to enter. 6. The prize draw will open at 00:00 on 10th January 2018 and close at 00:00 on 1st March 2018. 7. No purchase is necessary; it is free to enter this prize draw. 8. Multiple entries are not permitted. 9. Entries must be made on the official entry form. Incomplete, invalid or inappropriate entries, or entries received after the closing date will not be eligible for the chance to enter the prize draw. 10. The winner will be drawn at random from all valid entries received, and shall be notified by email or telephone, the prize will then be posted. Winners will be announced by 9th March 2018. The first prize will entitle the winner to up to £1,000 of Canon equipment of their choice from the Canon online store. The second prizes entitle the winners to one of two Canon LEGRIA HF G40 camcorders. Guaranteed seats at the Chris Packham talks (at The Photography Show) will be allocated to 24 individuals as the third prize. Show entry tickets must be purchased separately. The Prizes are non-transferable and no cash or credit alternatives will be substituted for the prizes on offer. In the event that the prize offered is unavailable due to circumstances beyond our control, Canon (UK) Ltd reserves the right to offer an alternative prize of equal or greater value. 11. Both Future Publishing Ltd and Canon (UK) Ltd reserve the right to refuse to honour any entry or to recover the full value of any prize if it considers there has been an abuse or breach of the terms and conditions of this competition. 12. In the event of a dispute over interpretation or implementation of the rules on any matter related to the competition, the decision of the Canon (UK) Ltd Directors is final and no correspondence will be entered into. 13. These terms and conditions and any disputes arising out of or in connection with them shall be governed by and construed in accordance with the laws of England and will be subject to the non-exclusive jurisdiction of the English courts.